The newly announced update to Office for iPad comes just over a month after the software first launched on Apple's popular touchscreen tablet. AirPrint support is now available for all three applications in the Office suite: Word, Excel and PowerPoint. 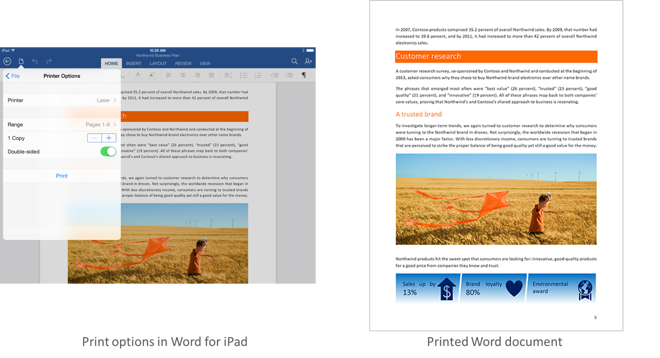 In Word for iPad, users can print a document with or without markup. In Excel, print-outs can come from a selected range, a single worksheet, or an entire spreadsheet. Individual pages or slides can also be selected to print. And the capability utilizes Apple's AirPrint standard, which means any AirPrint-enabled wireless printer is compatible. In addition, PowerPoint has also been updated with support for SmartGuides, which help users align pictures, shapes and text boxes as they are moved around on a slide. Microsoft promises that presentations can look "beautifully designed" on iPad with "very little effort." Excel has also been updated with AutoFit, which lets users adjust the width of multiple rows or the height of multiple columns at the same time. And all three applications have also seen various bug fixes and stability improvements. Users can view Office documents for free on iPad using Microsoft's applications, though editing capabilities require an Office 365 subscription. The company launched a new $69.99-per-year entry-level plan earlier this month, offering access to the service through one Mac or PC, as well as one iPad.